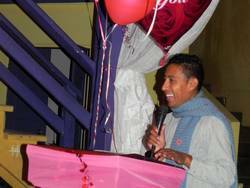 The San Pedro Sun held its annual Valentine's Day Poetry Competition in a relaxed setting at the Lions' Den during the Lions' first Valentine dinner on Saturday, February 12th. For years, the island newspaper has been holding a poetry contest, and often, the readings would be done at a different host restaurant. This year, partnering with the Lions proved to be a fabulous way to add to the sweet ambiance of Valentine's. During the night, Jorge Aldana, Tamara Sniffin and Mary Gonzalez read the winning poems aloud to those in attendance, from Honorable Mentions to an Ode to the Lobster, and finally, the grand prize winner. These were the poems that had been dropped off at the office, emailed, faxed, and mailed. Each poem received was worthy of prizes, so the judges had a hard time deciding. In the end, the categories each had their winners. Funniest - "Last Night I so Loved You" Nancy Moersch, Most Patriotic: "Belize is My Country" Freddy Nuñez, Most Romantic: "I Remember" Martha Perez, Ode to the Lobster: "Oh My Lobster" Freddy Nuñez, Grand Prize: "True Love" L.N. Garbutt and even two Honorable Mentions: "My Skye", Felix Ayuso and "Inspired", Melanie Paz. Providing wonderful prizes for the winners were our always generous sponsors: Funniest (Moersch): $50 Gift certificate - Red Ginger & Gift Certificate - Ambergris Divers; Patriotic (Nuñez): Snuba for 2 - Discovery Expeditions & $50 Gift Certificate - Mar de Colores; Romantic (Perez): One night stay for 2 - Sunbreeze Hotel & Snorkel for 2 at the Blue Hole - Amigos del Mar; Lobster (Nuñez) - Roundtrip - Tropic Air & Lunch for 2 - White Sands Cove; Honorable Mention (Ayuso): 24Hr cart rental - Carts Belize (Only persons over 21yrs) & $50 Certificate - Aquatic Sports; Honorable Mention (Paz): Pedicure & Reflexology Session- Asian Garden & Jewelry box - Graniel's Dreamland. The Grand Prize winner, Lindsford N. Garbutt won $150 Gift Certificate from Rapidito Loans and one night's stay for two at Ambergris Lake Villas. Congratulations to all the participants and thank you so very much to our generous sponsors who make this competition a success every year! 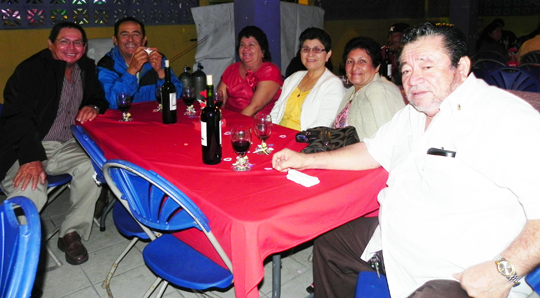 A special thanks also goes to the SP Lions for helping us host the contest during their dinner. We invite you to start thinking of your poems for next year. Who knows, you just might be the big winner of the night! When will the Ambergris Stadium be completed?